From Mendocino, CA, this wine is made from 100% Cabernet Sauvignon grapes. It will delight you with wonderful aromas of ripe blackberries, dried cranberry and cracked pepper. A great value for this cab! 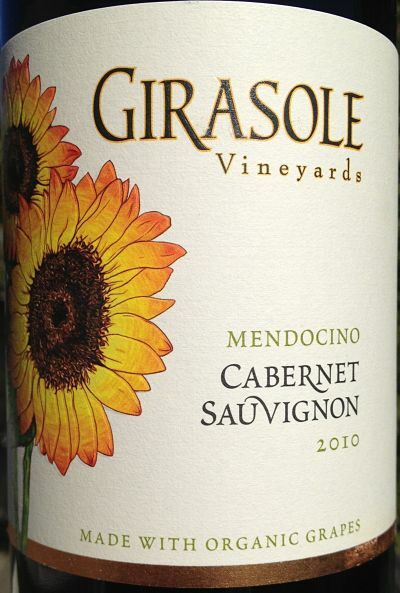 This Girasole Vineyards Cabernet Sauvignon will delight you with wonderful aromas of ripe blackberries, dried cranberry and cracked pepper. Upon taking your first sip you will notice flavors of sweet red fruits, baking spice and just a hint of toasty French Oak. This lovely wine lingers on the palate and awakens the senses! Perfect with grilled or roasted vegetables, red meats or game. A terrific accompaniment to blue and other hearty cheeses.